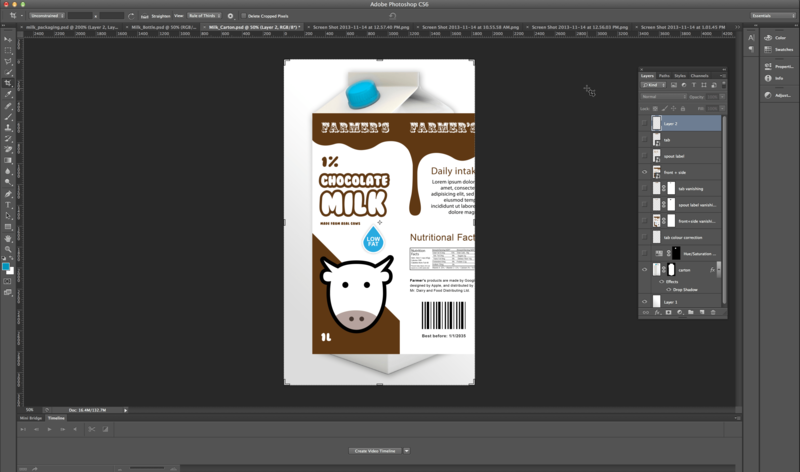 In this tutorial, I will be mapping artwork that I have created for a fictional package design using Adobe Illustrator with Photoshop’s Vanishing point filter. I also show my class how to create this effect in Illustrator using the 3D Extrude & Bevel and Revolve effects but this is a nice alternative to Illustrator’s 3D effects. 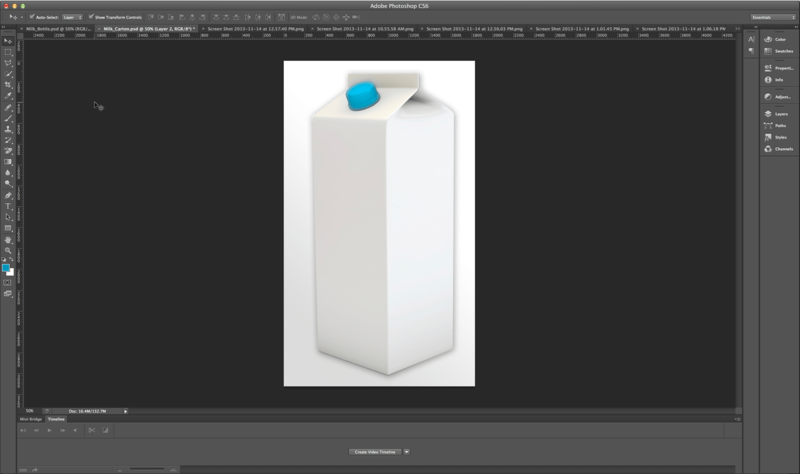 Open up the image of the milk carton in Photoshop. Open the artwork file in Illustrator. 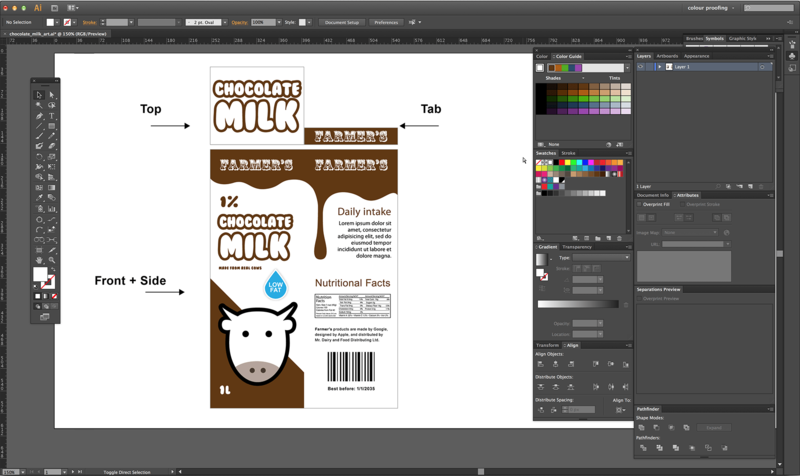 Select the artwork’s front and side panels in Illustrator using the selection tool and copy the artwork. [Cmd + C] This will save your artwork to the clipboard. We will be pasting our artwork in the Photoshop file in a while. Move over to Photoshop and create a new layer in the carton image file [Cmd + Shift + N] and name it “Vanishing Point.” Then go to the menu bar and select Filter > Vanishing Point [Cmd + Opt + V]. You will see the Vanishing Point dialog box open-up. Select the Edit Plane Tool (V) from the left hand side and draw around the front side of the box by clicking the corners of the box. 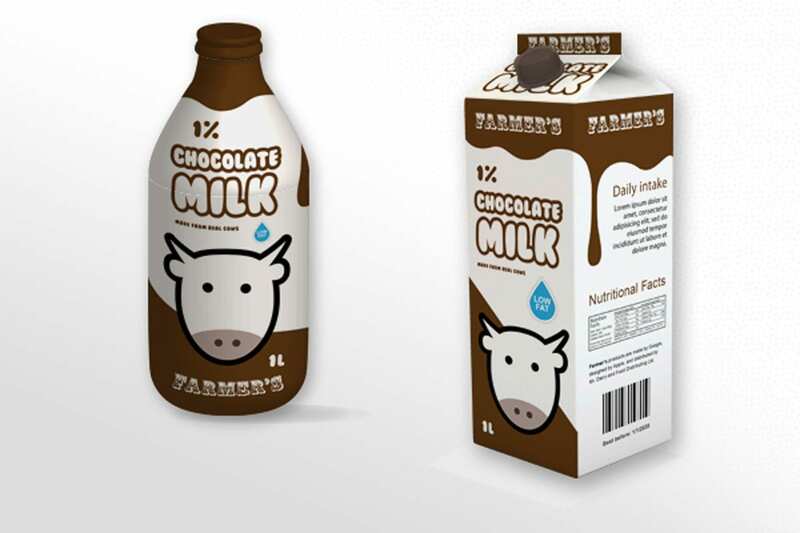 The corners of the carton have subtle curves but we can fix up those details by adding a layer mask to the entire carton afterwards and hiding any areas that protrude outward from the corners. 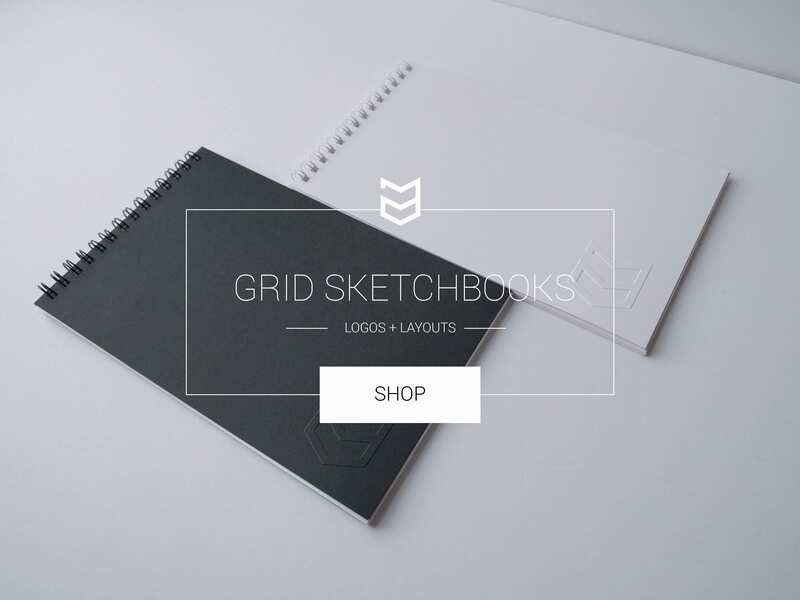 Next, hold the [Cmd] key and click the middle-right handle of the grid-box. Drag your mouse to the right until your cursor reaches the back-end of the box. You can edit the grid to lineup with the corners of the box by holding down the [Opt] key and dragging the corners to their correct location with your cursor. When you are done, click the OK button. 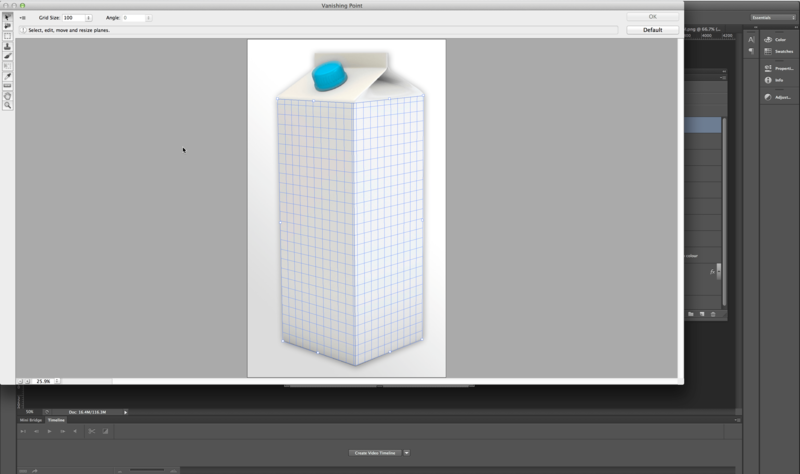 Now paste the artwork which you copied from Illustrator as a smart object. 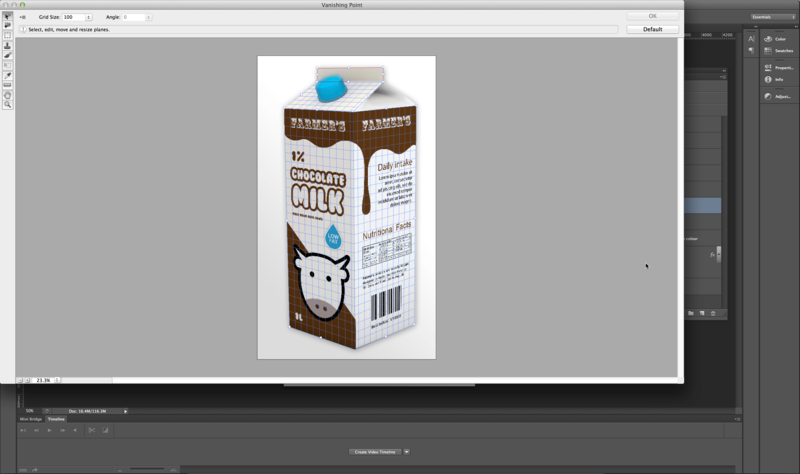 [Cmd + V] Scale the artwork by selecting the Free Transform tool [Edit > Free Transform] while holding the SHIFT key until the top-left and bottom-right corners of the artwork cover the front and side of the carton image. click the check mark in the control panel to apply the transformation. Now that your artwork is on it’s own layer, hold the [Cmd] key and click on the layers thumbnail with the art work. This will make an active selection appear on the layer. Copy the selection [Cmd+C] and then hide the artwork layer by selecting the visibility icon and deselect the selection by pressing [Cmd+D]. *When copying the artwork selection, make sure you are selecting the correct layer with the artwork. Select and highlight the “vanishing point” layer that you created earlier and go back to the Vanishing Point filter. (Filter > Vanishing Point). With the vanishing point dialog open, paste the artwork [Cmd+V] and drag it on top of the vanishing point grid with your cursor. You will see the artwork map to the grid. 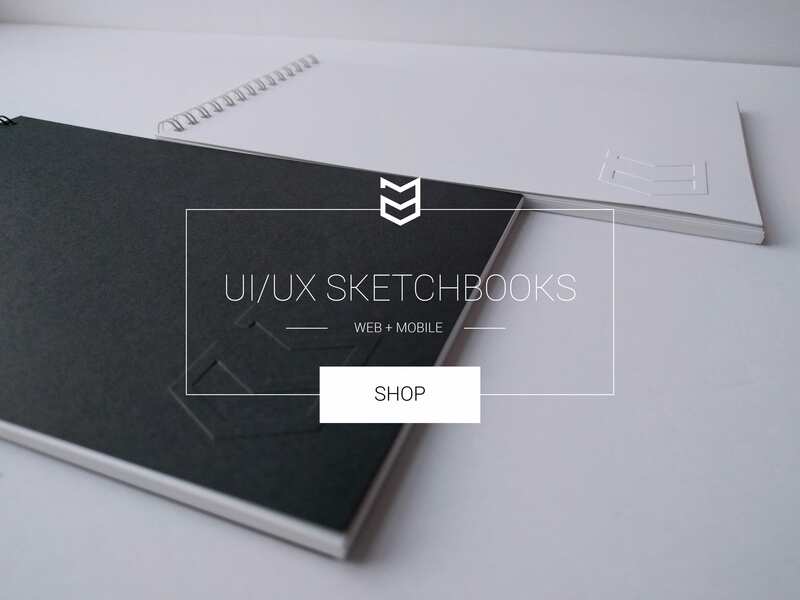 After dragging the artwork on to the grid, it might be larger or smaller than the grid area. To scale and fit the image to the carton’s surface, transform the artwork by selecting the Transform Tool on the left hand side of the Vanishing Point’s dialog panel. [Cmd + T]. *If you don’t see the corners of the artwork when scaling, drag the image upwards or downwards until you see the corner handles of the image—then scale the image. Once you’ve finished positioning the artwork in the Vanishing Point dialog, click OK to close the dialog. 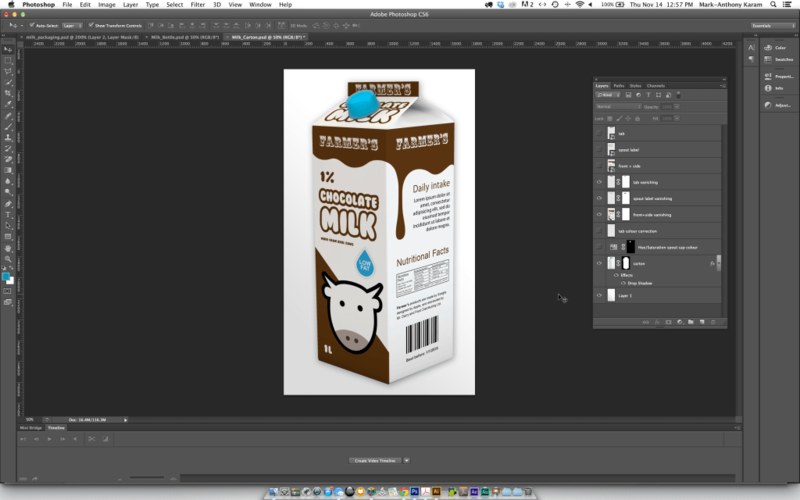 To allow the texture of the carton to show through, change the artwork’s layer blend mode from Normal to Multiply. You will see the texture of the carton and corners of the carton become slightly visible through the artwork. To add a bit more detail to the 3D image, you can make a selection around the spout cap and recolour it using the hue and saturation adjustment layer or painting in the selection with your paint brush. If you choose to recolour the spout cap using your paint brush, remember to change your blend mode from Normal to Multiply or Colour, depending on the effect you are looking to achieve. This way you can see the details of the cap come through the colour. You can also create a layer mask around the entire box and clean up some of the edges around the corners of the carton. I created two additional vanishing point layers and added the top of the carton and the tab of the carton’s artwork by repeating the above steps. I also added a layer mask to hide a portion of the spout cap.